At least 11 peasants' wings of the Left Front in the state are scheduled to hold the "march to Nabanna" rally' in five different parts of Kolkata. Many Left Front legislators who planned a rally outside the Secretariat in Kolkata were detained. 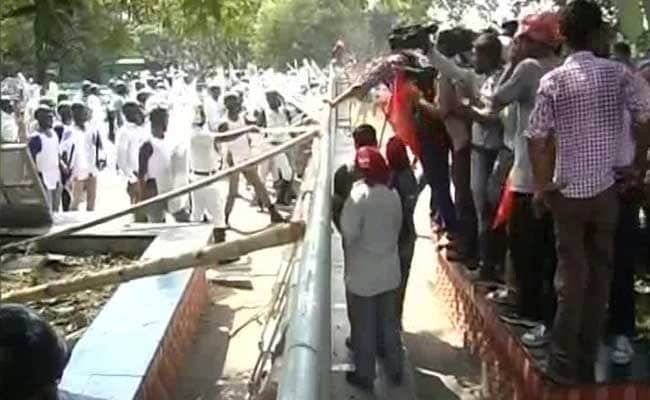 Kolkata: A number of Left Front legislators including its legislature party leader Sujan Chakraborty were detained from outside the State Secretariat on Monday even before the start of the opposition group's rally. "Twenty of our MLAs reached the gate of Nabanna (Secretariat building) to protest against the issues of unemployment, farmers' distress and other issues. But the police did not let us in. They forcefully stopped us and later put us in police vans. They are not disclosing whether we are in police custody or not," Mr Chakraborty told IANS. "The Chief Minister has fled from the city. Is she not bothered about the plight of the farmers here? She has turned the state into a prison," he added. At least 11 peasants' wings of the Left Front in the state are scheduled to hold the "march to Nabanna" rally' in five different parts of the city. Left Front chairman Biman Bose claimed the legislators were arrested and demanded their unconditional release. "...They have been arrested and are being taken to Alipore court. We condemn their arrest and demand their unconditional release," he said. However, the police have not confirmed the arrests. The Secretariat has been converted into a virtual fortress with all entry points blocked alongside deployment of a large police force. Plainclothes policemen are also on duty to thwart any untoward incident.